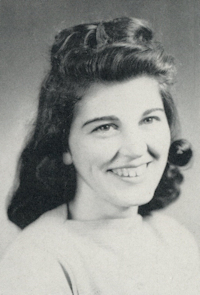 Obituary – Moore, Karel Marie (Miller) « Perry High School Alumni Association, Inc. Assembly 55-56; All School Revue 56-67; Red Hots 57-58; Christmas Vespers 55-56. ﻿Karel M. Moore, 77, of Perry, Oklahoma died Saturday, April 29, 2017, at the Green Valley Nursing Home in Perry, Oklahoma. She was born in Rogers, Arkansas on June 8, 1939, to George and Opal (Robbins) Miller. Services have been entrusted to Brown-Dugger Funeral Home in Perry, Oklahoma. Mrs. Moore was an assembler at Ditch Witch and had worked at various other positions in the community. She was a member of the Covington, Oklahoma Lions Club and would often visit with friends and spend time at the Covington Senior Citizens Center. Mrs. Moore enjoyed following the Thunder and Oklahoma State University sports teams. Preceding her in death was her husband, Stanley. two sons, William and Michael Moore. Two sisters, Beverly Moore and Edna Battles. Two brothers, James and Edwin Miller. She is survived by her two daughters, Sherri Dehaas and spouse, Orville of Perry, Oklahoma and Tammy Aldrich and spouse, James of Aurora, Colorado. One brother, Ernest Miller, and spouse, Jan of Arlington, Texas. Five grandchildren, Reanna Moore, and spouse, Nicole, Cindy White, Brian Dehaas and spouse, Whitney, Jody White, Jared DeHaas and spouse, Nicole. Mrs. Moore is also survived by nine great-great-grandchildren and many nieces and nephews. Memorial Services for Ms. Karel Moore will be held on Saturday, May 20, 2017, at 10:00 am in the Kaw Street Chapel, Perry, Oklahoma.